Thanks to writer CJ Johnson for making me the first subject of her new Weekly Book Spotlight – author interviews on her blog . She asked a few pertinent questions and invited me to answer them at any length I chose. 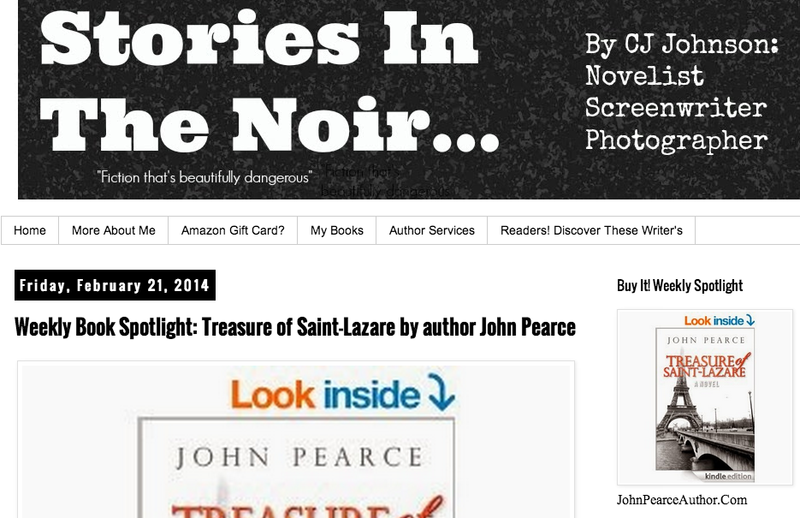 I am extremely excited to kick-off the weekly book spotlight with some of the most talented indie authors who write books that fall in the mystery, thriller, and dark romance sub-genres, here on Stories In The Noir. 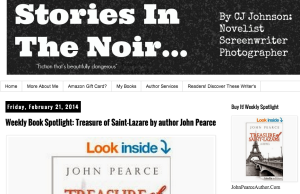 The first indie author on, Stories In The Noir, to tell us about his new book, Treasure at Saint-Lazare, is John Pearce. He was gracious enough to answer my questions about his book. The book is set in Sarasota, Florida and Paris, France. What inspired you to place the novel in those locales? When I started to plot Treasure of Saint-Lazare there was only one non-negotiable requirement — It had to be set in Paris. I am a committed Paris lover, to the extent that my wife Jan and I live there for a couple of months every year. Sarasota was easier. That’s where we live the rest of the time. It’s a nice small city on the West Coast of Florida, but has enough Elmore Leonard characters in it to make my cast of disreputables believable. 2. In the book, the story’s premise surrounds capturing the missing paining, “Portrait of a young man” by the Renaissance master painter, Raphael. With that in mind, are you drawn to the art world and why that painting as a focus? I’m a fan of art, but not to the point of being able to call myself an expert. I was looking for a story that would reach back into World War II and forward into the present, and it seemed to me the continuing search for the priceless art treasures stolen by the Nazis would be a good vehicle for the story. It didn’t hurt that George Clooney started filming The Monuments Men just a few months after Treasure of Saint-Lazare was published.